When you save your TeamSQL queries, they are then available to you no matter where you are. Powerful search functionality means that searching in the cloud is as easy as searching on your computer. TeamSQL allows you to save and manage Oracle, MySQL, PostgreSQL, Microsoft SQL Server, Amazon Redshift SQL files or Redis commands using the Cloud Storage area. See all of the queries you've executed. Clicking on a query lets you see a preview of the executed query, as well as the cached result set from when that query ran. Create teams, which make it easy to share SQL queries with multiple people at once, or you can share queries to individuals. Send data to others via hyperlink. Use TeamSQL to generate a hyperlink that you then provide to your colleagues. Your colleagues can access the data by navigating to the provided URL, where they can then save the data for their use in JSON, CSV or tab-delimited format. SQL Queries that your colleagues have shared with you are listed and groupped by teams and connections. Rather than limiting you to snippets we think you'll find useful, we're allowing you to create your own snippets. For example, do you find yourself running a specific query early and often? Turn it into a snippet instead pf copying instead of copying and pasting from an external file. Snippets are templates that you can use to help you build longer queries. Because TeamSQL knows which database you're working in, you'll get the right snippet at the right time(if you work in multiple types of databases, you'll know how easy it is to get similar-but-different syntaxes mixed up). 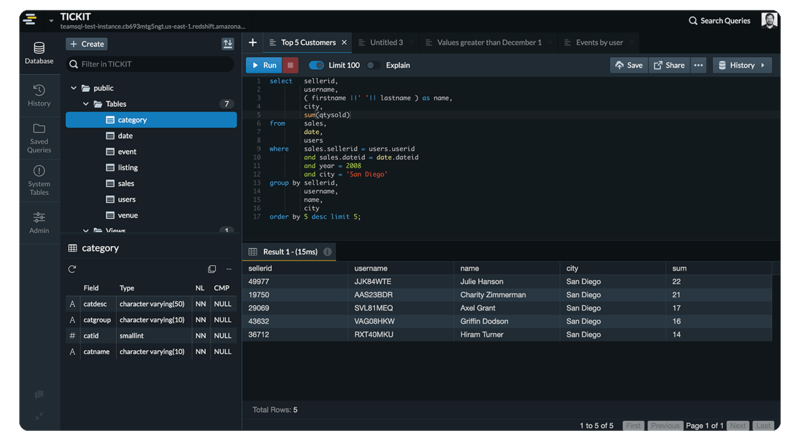 Now, you're less likely to run a query that works for MySQL against Oracle, Microsoft SQL Server, Amazon Redshift, PostgreSQL or Redis. The Charts feature of TeamSQL is powerful with advanced aggregation and visualization options. Create bar, area, line, pie, scatter, funnel and bullet charts, as well as heat maps, using the data you return from your database. You don't need to export your data to a separate data visualization tool.